Somewhere in between the football tearjerker Rudy and the offbeat cult-classic Jamaican bobsled team bio Cool Runnings, there is room for this very disarming, true-life tale of a bumbling British ski jumper, Michael "Eddie" Edwards, who made it to the 1988 Calgary Olympics, against the odds, and experienced fame. Grab some popcorn and be prepared to take a leap of faith. 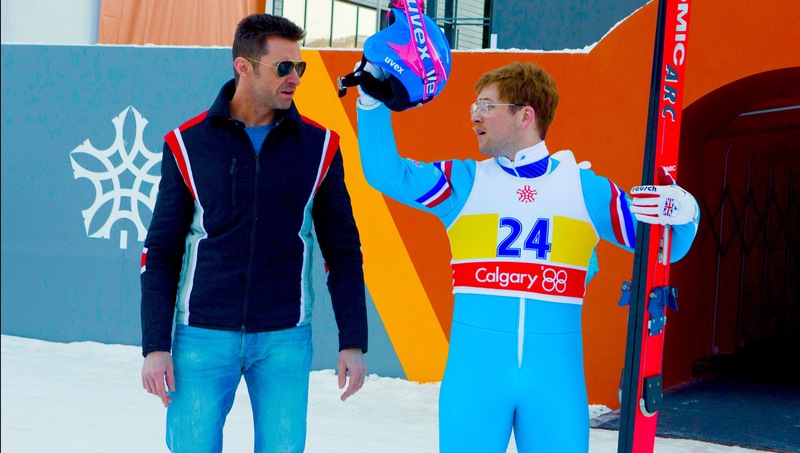 Hugh Jackmand and Taron Egerton co-star in the bio/sports film Eddie the Eagle. These are the facts: Eddie Edwards was born in Cheltenham, Gloucestershire England. As a young adult he was a decent downhill skier, but not good enough to make the British team for the 1984 Winter Olympics. He moved to Lake Placid, NY to train, and switched his sport to ski jumping, as there were no other British jumpers and that would ensure him a spot on the team. He weighed more than most jumpers, was desperately far sighted and wore thick glasses that fogged up when he jumped. Still, he made it into the 1988 games and became a media darling. That's the kernel of truth that's embellished by screenwriters Sean Macaulay and Simon Kelton, director Dexter Fletcher (Wild Bill) and director-turned-producer Matthew Vaughn (Kingsman: The Secret Service). Fiction gets blended with facts as the movie begins: In 1973 Britain, a nerdy little kid (Tom Costello and Jack Costello) imagines being an Olympic winner, and to that end tries to master every sport in the world, to no avail. He has the coordination of a drunken puppy and glasses thicker than Coke bottles. Yet, he's headstrong, determined and irrepressible. His mom (Jo Hartley) is supportive, his dad (Keith Allen) would prefer he prepare himself for a life as a blue-collar worker, a plasterer, like himself. Eddie will hear none of that. As a young adult Eddie (Taron Egerton, Kingsmen: The Secret Service) tries desperately to make the 1984 downhill winter ski team. He practices with fellow skiers, but gets cut from the team and his coach notes, "You will never be Olympic material." Undeterred, and knowing that Britain does not have a ski jumper; Eddie takes up that sport. He heads to snowy, wintry Garmisch-Partenkirchen, Germany, and before you know it, he's at the top of a daunting takeoff ramp trying to learn a new craft. Eddie's feeble attempts at jumping are noticed by a Bronson Peary (Hugh Jackman) who drives s snowplow. He happens to be an ex-jumping champion whose career was thwarted. Reluctantly Peary, an alcoholic, takes Eddie under his wing and coaches him to a last place finish at the 1987 World Championships. That performance, placing 55th, is enough to qualify for the 1988 Winter Olympics in Calgary, Canada. Yes the script, direction and production follows a tried-and-true formula: Set up a vulnerable central character who has no chance of fulfilling his dreams. Beat him up, add in a throng of mean antagonists (the Norwegian ski team needles Eddie unmercifully) and let the audience watch the loser struggle until he finally wins, even if it is only on his own terms. It's a recipe that worked for Rudy and Cool Runnings, and it's effective here. Adding the fictional Peary character, as a lost soul looking for redemption, is a smart strategy and gives Eddie more weight to carry. Peary to his charge:" They'll make you a fool." Eddie to his coach/surrogate older brother: "I'd rather be a fool than a drunken coward." There are plenty of bumps in the road. By the time Eddie is ready for his big 90-meter Olympic jump, you have so much riding on his success that you're perfectly willing to dial down your expectations. Gold? Silver? Bronze? Hell no. Dude just make the damn jump! Taron Egerton's perception of Eddie is awkward and endearing. He wins you over with his befuddled looks, even though he is wearing a very distracting toupee or a bad perm. Jackman, who should have won an Oscar for Les Miserables, tones down his large persona (yeah, this guy is Wolverine) to inhabit the aura of a failed athlete who calls his flask of booze a "jacket," one he wears daily. Jackman displays the right mix of angst, self-pity and rebellion. Jo Hartley plays the unconditionally loving mother in a way that makes you want to take her home. Comedian/actor Keith Allen, as the disapproving dad, creates an indelible character that is the archetypal, tough-love father figure. The musical score (Matthew Margeson) and cinematography (George Richmond, Quantum of Solace) add just the right amount of drama and atmosphere, especially during Eddie's perilous, death defying jumps. Martin Walsh's (Chicago) editing whittles the footage down to a comfortably long one hour and 45 minutes. If success were only measured by winning, many of us would have no reason to get up in the morning. If success is about staying in the fight, then everyone can relate to this tale of a misfit who never fits in, but discovers a way to stand out. Coincidently Edwards, who is seen in an archival clip at the end of the movie, competed in the same winter Olympics as the Jamaican bobsled team. 1988 must have be a good year for raw determination. If you think you can resist the charms of this family-friendly movie, guess again.